Once upon a time, a teacher wanted to teach multiple children, of varying ages at the same time…Ok, maybe that isn’t the beginning of an actual fairy tale, but I think most homeschool moms think it is. They want to believe the impossible—that it’s a true story. Let me assure you, not only is it possible, your family can have a lot of fun, too! Especially when it comes to writing. Yes, your students need writing instruction and assignments according to their grade levels, but that doesn’t mean you can’t at least do some activities together. The key: expect students to produce work at the appropriate level for their ages. Often as homeschooling moms, we think “Sure, creative writing is fine for my younger kinds, but my high school students need to get more serious.” And so we teach academic writing forms, and neglect creative writing almost completely. However, I believe creative writing skills enhance academic writing. Student’s ability to hook the readers attention, to cleverly use humor to make a point, and connect concepts from a unique perspective in academic writing will make their essays shine. Think of creative writing as exercise, building up academic writing muscles. And let’s face it, high school kids need to have a little fun, too. So whether you have elementary, intermediate, or high school children (or all of the above), make writing fun. There are three little pigs just waiting to help. Begin by reading The Three Little Pigs. I suggest choosing a traditional version of the story, but it’s up to you how traditional it is. In the original the first two pigs get eaten by the wolf. And the wolf was boiled and eaten by the third pig. Oh my. Of course, my teen boys would enjoy the original version best. I loved reading from A Treasury of Children’s Literature edited by Armand Eisen when they were younger, though. It includes fairy tales, traditional stories, nursery rhymes, tall tales, and even some poetry. You can also find versions of The Three Little Pigs online, or you may just remember it from when you were a child. After reading the story you will want to discuss two literary terms: setting and point of view. But how significant is the setting of The Three Little Pigs? What might happen if you changed it? We will get back to that in just a bit. To help your children understand the difference, ask one of them to tell a story about something they did today. That is first-person point-of-view. Then have one of your children tell about something that you did today. That is third-person point-of-view. Easy. For older students, they will also need to know a little more about third-person point of view. Omniscient point of view means that the narrator knows everything—the thoughts and feelings of all the characters, while limited omniscient means the narrator only knows one character’s. With the objective point of view, the narrator tells the story without knowing any of the characters’ thoughts or feelings. What would happen if the point of view was different? What if it was told in first-person? Or the third-person omniscient point of view? If you can, read the story told through the wolf’s eyes in The True Story of the 3 Little Pigs by Jon Scieszka. Clearly, the point of view affects a story significantly. Now it is time for you students to practice what they have learned. Their mother sent them out to seek their fortunes. The first pig found a man selling straw. He bought the straw and built a house with it. The second pig found a man selling sticks. He bought the sticks and built a house with them. The third pig found a man selling bricks. He bought the bricks and built a house with them. A wolf found the first pig’s house. He knocked on the door and told the pig he wanted to come in. The pig said no, so the wolf blew his house down. The pig ran to his brother’s house of sticks. The wolf found the second pig’s house. He knocked on the door and told the pig he wanted to come in. The pig said no, so the wolf blew his house down. The first and second pig ran to their brother’s house of bricks. Finally, the wolf found the third pig’s house. He knocked on the door and told the pig he wanted to come in. The pig said no, but this time the wolf couldn’t blow the house down. The three pigs were safe. He tried to get in a different way—down the chimney. The pigs built a fire before he could get down the chimney. He got out of the chimney quickly. 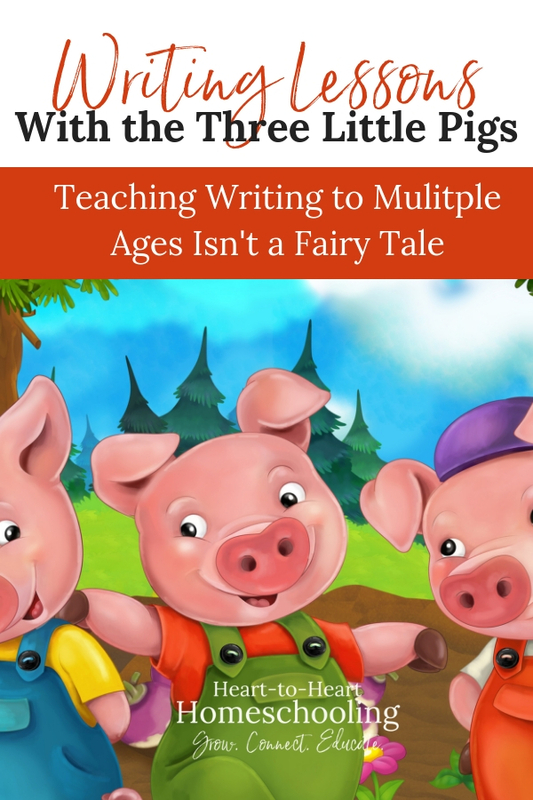 Rewrite the story of The Three Little Pigs using a different setting (or if they are too young to write it themselves, let them dictate their story to you). Before they start writing though, talk to them about how the new setting they chose will affect the story. What details might change based on the new setting? Rewrite The Three Little Pigs from a different point of view. What if the mother pig told the story? What if it was written in first-person by one of the pigs? How might a narrator who knows all of the feelings and thoughts of the characters tell the story? Older students can choose either of these writing assignments or preferably, combine them. Rewrite The Three Little Pigs with both a different setting and point of view and see what happens. Encourage them to add details, descriptive paragraphs, and literary elements to their versions. The possibilities truly are endless. Will you give your pigs names? What might their houses be built from based on a new setting? What details can you add to the story to make it more interesting? Brainstorm ideas as a family. Give each other suggestions. And if you are really brave, join the fun. And that is the most important part, to have fun with the project! Students can illustrate their new stories with drawings or even computer-generated graphic art. Are your children interested in theater? Then encourage them to write their version as a play and perform it. My favorite resource for teaching writing: Brave Writer. 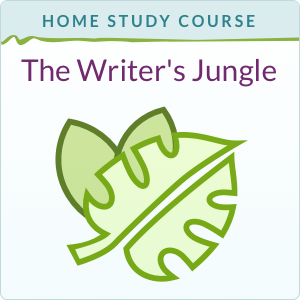 Check out The Writer’s Jungle by Julie Bogart. It teaches you how to teach writing to your kids. Write Source 2000: A Guide to Writing, Thinking, and Learning, 4th Edition, written and compiled by Patrick Sebranek, Dave Kemper, and Verne Meyer. This would be such a nice intro creative writing for my son (whose rather reluctant at 8!). Thanks for sharing. excellent lesson! I worked through this story with my lad from different vantage points when he was little.